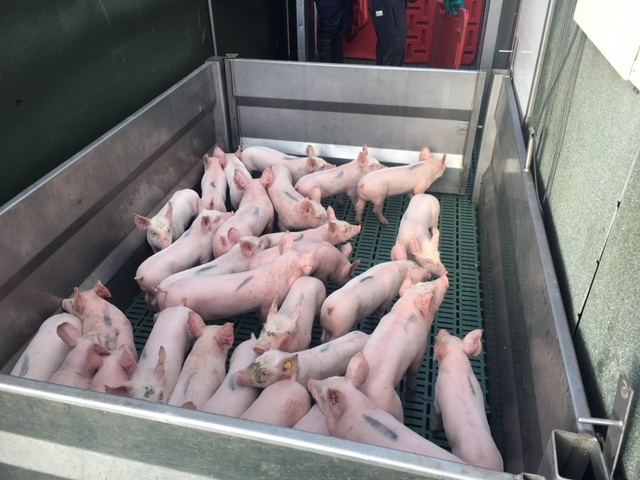 The piglet research trial is underway at SM Pigs Co.Tyrone. I will travel once or twice a week to the farm where I will collect samples from the research trial and weigh the pigs at change of diets. I will collect faecal samples at each change of diet along with feed samples. Bloods will be taken by vet at the beginning of the trial and at the end of the trial. I really enjoy the hands on experience I am gaining by helping with running the trials and handling the piglets. I had no experience with pigs prior to this so everything is completely new and exciting to me! Piglets being weighed on large weighing scales.